I know we can’t really do this, what with Wellington Wind and all, but I do love a good brolly. Here’s a street with quite a few of them ! Reminds me of the buddhist peace flags up during the last Cuba Carnival – word on the street is that somehow, weirdly, two different Cuba Carnivals are being planned – and also that Cuba Carnival will be on the waterfront, not in Cuba St. Anyway – forecast is for rain – take your brollie. 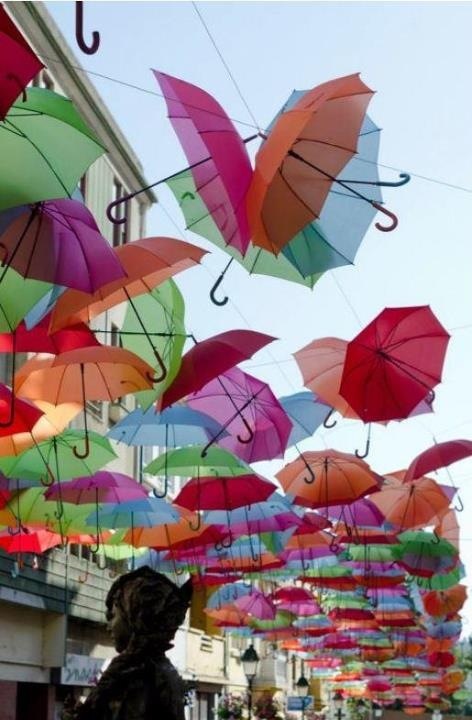 I reckon it would be great to have a developing sculpture made out of the umbrellas that get killed by the Wellington wind – you know how we always see them sitting in rubbish bins? Best thought I could come up with was some kind of bird, with the umbrellas being the quills.